The Metropolitan Washington Council of Governments’ Metro Strategy Group has failed to reach a hoped-for agreement on how best to raise the $500 million per year for Metro needs. And now officials are considering a stopgap measure to buy more time to build a consensus on how to address Metro's $6.1 billion funding shortage. WASHINGTON — Bowing to reality that new regionwide dedicated funding for Metro is unlikely to pass during this winter’s General Assembly sessions, a key panel of the region’s elected officials now backs a one-year funding patch to cover significant repairs needed to prevent the rail system from falling apart further. The lukewarm endorsement of something like Maryland Gov. Larry Hogan’s suggestion that D.C., Maryland, Virginia and the federal government each contribute $125 million more per year requires a promise that some type of dedicated, recurring and bondable funding would be identified and acted on in the legislative sessions that begin in January 2019. Without a temporary patch, Arlington County and Metro Board member Christian Dorsey said the county would have to cut spending in other areas or significantly raise its own tax rates. And without a long-term dedicated tax, Dorsey suggested that General Manager Paul Wiedefeld might leave. “There’s no possible way he can deliver what he has articulated the agency needs to deliver without getting permanent dedicated funding. And I can’t imagine under any circumstance if that became an impossibility that he would find this to be something that he would want to continue to lead,” Dorsey said. “This is not a wish-list of optional items … this is now, and it has to be done,” he said. The District would reluctantly back a one-year funding patch to buy time for a longer-term fix, D.C. Council Chairman Phil Mendelson said. To counter Hogan’s short-term funding suggestion, which would be contingent on the federal government agreeing to provide additional money, the entire D.C. Council introduced a largely ceremonial bill this week that would provide new Metro capital funding through a 0.75 percent regional sales tax — if Maryland and Virginia agreed to go along. Virginia leaders are concerned that under any flat sales tax proposal, most of the money would be collected in Virginia. And the District is pressing for a long-term funding deal. 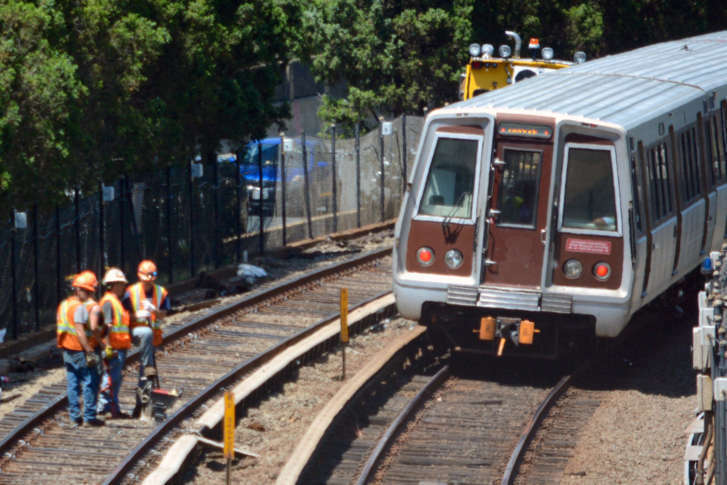 The Metropolitan Washington Council of Governments’ Metro Strategy Group has failed to reach a hoped-for agreement on how best to raise the $500 million per year the region’s officials agree that Metro needs. The full Council of Governments board is considering a special meeting in December to hash out some type of official position before Virginia’s and Maryland’s general assemblies convene. “As we continue to push forward to secure a permanent dedicated funding solution, we are keenly aware that we need to begin covering the $6.1 billion gap over 10 years beginning in fiscal year 2019, even if we are not able to make all of the 2019 funding bondable at these rates,” Prince George’s County Chair Derrick Leon Davis said. “It is critical that we solidify a deal on permanent dedicated funding, but we need to make sure that if we do not immediately, that we make a significant down payment,” Davis said. Davis described the strategy group’s last closed-door meeting as extraordinarily “frank” on the needs and realistic odds of achieving even a short-term funding agreement. Metro’s official Capital Funding Agreement expires in June, but could be extended another year. “While a step along this path may necessarily need to occur without all of the funding being bondable at the best rate, this action will keep the momentum going and assure that Metro can move forward with its capital program as recommended by the general manager,” Davis said. Within the next week, former U.S. Transportation Sec. Ray LaHood’s long-awaited final report on Metro’s governance and other issues is due to be released by Virginia. Loudoun County Supervisor Matt Letourneau believes any funding request must be coupled with significant Metro Board reforms, which have at least vague support from a number of elected leaders. “It may be governance and funding at the same time, because that’s the way the General Assembly — and not just Republicans but Democrats too — are looking at this,” Letourneau said. Sen. George Barker, a Democrat and a key member of the Metro Strategy Group who has served as a liaison to Richmond, said it is important that governance and funding changes move forward together as much as possible. “We need to move forward now on funding, even if we can’t get all of it to be bondable at the best rate yet, so that we begin to make sure that we’re sending a clear message and also providing what will be needed in terms of long-term resources,” Barker said. Control of Virginia’s House of Delegates is still in doubt after Tuesday’s election, with Democrats still holding out hope of taking control of the chamber. “That will probably affect what our strategy is moving forward,” Letourneau said. Virginia’s next governor, Lt. Gov. Ralph Northam, has been briefed regularly on Metro’s issues, Barker said. “We have some significant changes in the house of delegates that we’re going to have to sort through. But I am confident that from both the Democratic and Republican sides in the Virginia General Assembly that we can work through this to get things done and to help meet our responsibility as one of the partners in addressing this issue maybe on a short-term basis now, but also as part of a long-term strategy,” Barker said.